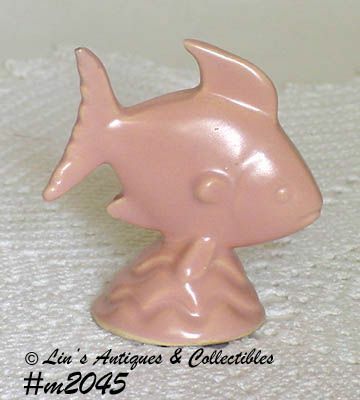 I’m not certain who produced this cute little pottery mini fish! It measures 3” tall (at tallest) and is in very good condition. Has a tiny ding on bottom dry (setting) ring and a ½” hairline at base – doesn’t go through and you almost need a magnifying glass to see it! Neat collectible. 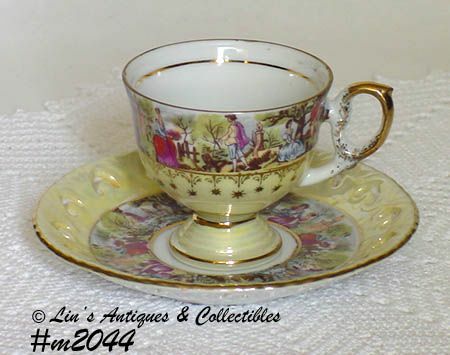 I have had this lovely Lefton cup and saucer for quite a while and displayed vintage pins with it because the “courting” scenes are very similar to ones on porcelain pins! Both cup and saucer have the numbers “5064” on them and both pieces are in excellent condition with no chips, dings, or cracks. Very pretty! 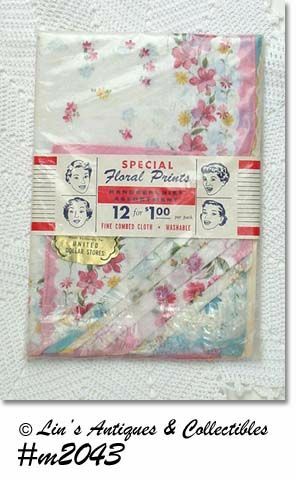 This handkerchief listing has 12 floral hankies mint condition still in the original package! Per package, they were “made exclusively for United Dollar Stores” and are made of “fine combed cotton”. I opened package to be certain there were 12 and indeed there were! Neat “How To” book for Sears Roebuck ColdSpot freezers! Book has instructions on how to care for your freezer, to prepare food for freezing, to freeze and store foods, and to thaw and prepare foods for the table. Interesting! I’ve grouped these Washington D.C. items into one listing. There’s a street and vicinity guide to Washington D.C., dated 1971 from Texaco. Next is book “Points of Interest in and about Washington”, compliments of American Oil Company with copyright date of 1938. 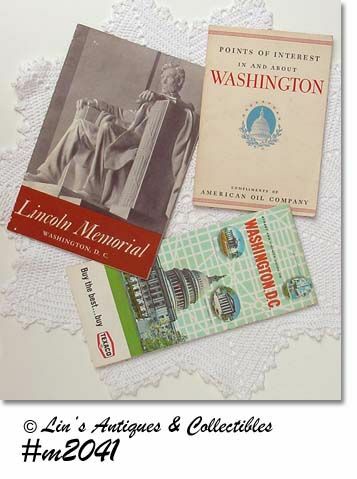 Last is a brochure/leaflet about the Lincoln Memorial from the U.S. Government Printing Office and is dated 1947. 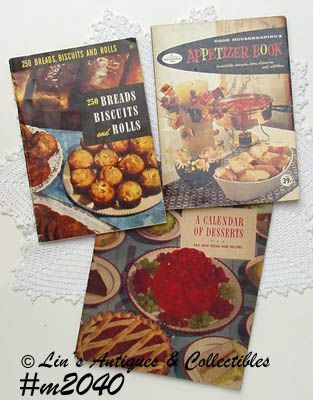 I’ve grouped these three cookbooks into one listing! First one is “250 Breads, Biscuits, and Rolls”, edited by Ruth Berolzheimer, the Director of the Culinary Arts Institute, and the book is dated 1950. Next is Good Housekeeping’s “Appetizer Book” with copyright date of 1958. Last is “A Calendar of Desserts” by General Foods and dated 1940. All three books are in wonderful condition!! "LEARN HOW" BOOK -- CROCHET, KNITTING, TATTING, ETC. Neat learn “how to” book! 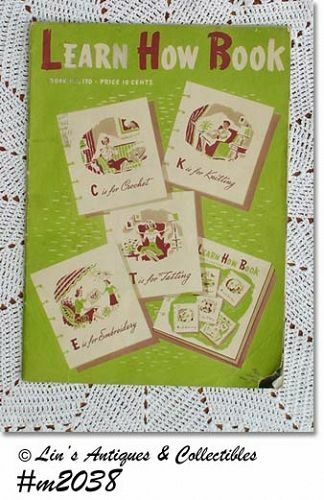 This one shows instructions for crochet, knitting, tatting, and embroidery. These are just a few of the items to create: crocheted collar, crocheted luncheon set, crocheted change purse, afghan, filet tray cloth, mittens, anklets, tatted edging for hankies, collars, etc, monograms. Book has copyright date of 1941 by The Spool Cotton Company and is in very good condition! Aren’t these pretty? 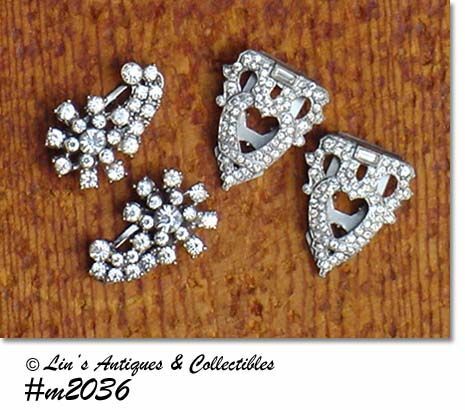 This listing has 2 pairs of rhinestone dress (or scarf) clips. They measure 1 ½” long and are in great condition! 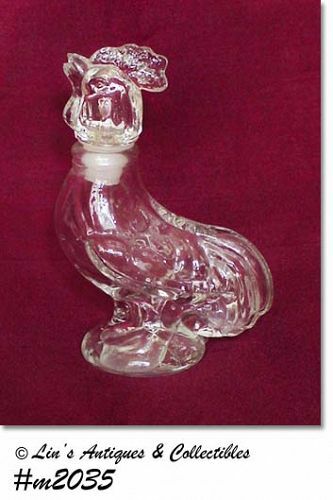 This is an eye-catching Lady vase! 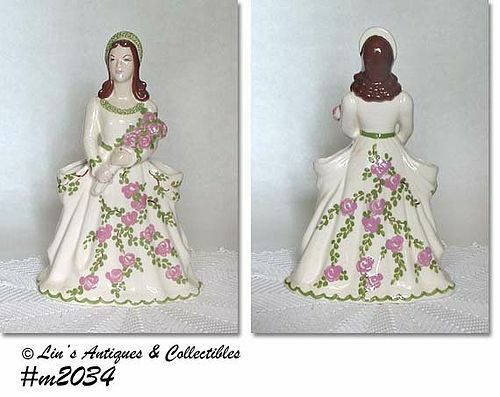 Made by Hollywood Ceramics (marking is very difficult to see due to glaze fill-in), vase measures 12 ¼” tall, base measures 8” long, 4 1/8” wide – this is not a small vase. She has no chips, no cracks, does have pretty crazing. 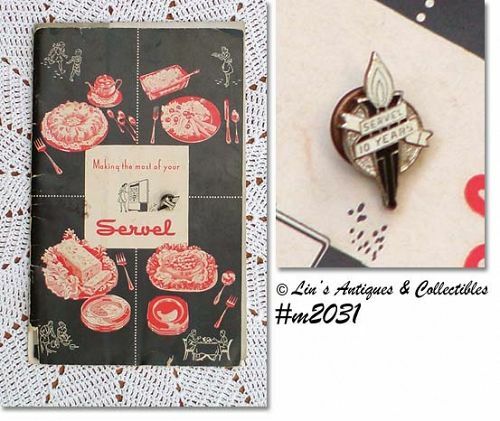 This listing has neat cross-over collectibles – a Servel recipe booklet and a 10 year service pin! 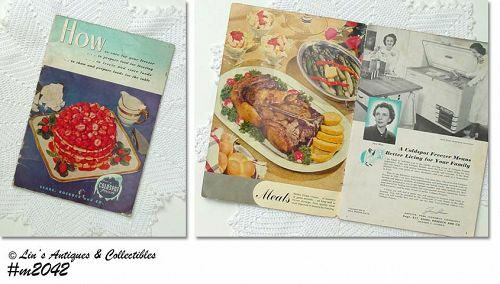 Booklet has a copyright date of 1947 and has instructions for use and food storage using the owner’s new Servel refrigerator – also has some neat recipes. Servel refrigerators were produced in Evansville, Indiana. Book is in great condition –cover has come loose from the staple “binding”. Service pin is tack pin style and is in excellent condition. 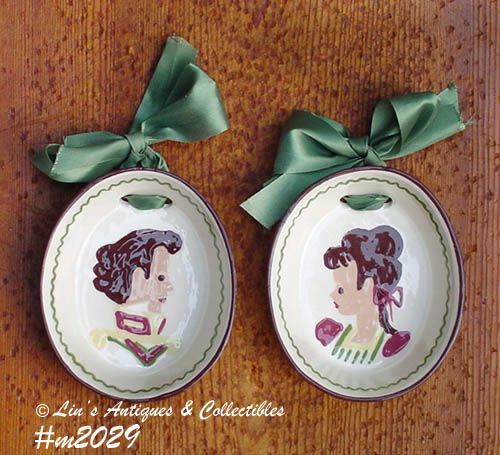 Aren’t these little wall plaques adorable? Made by Cleminson Pottery, they’re oval shaped with a man on one, a lady on the other. They measure 4 1/8” long (at longest), 3 3/8” wide (at center), and backs are stamped “The California Cleminsons, Hand Painted”. Plaques are in excellent condition. They have green ribbons for hanging. This is a most unusual item – a decorative egg plate made by Holt Howard! 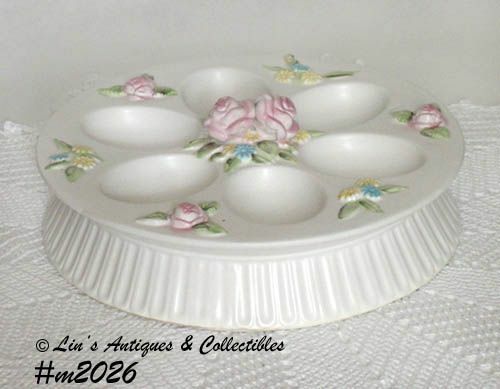 Plate is dated 1959, holds 6 eggs, and is in excellent condition. 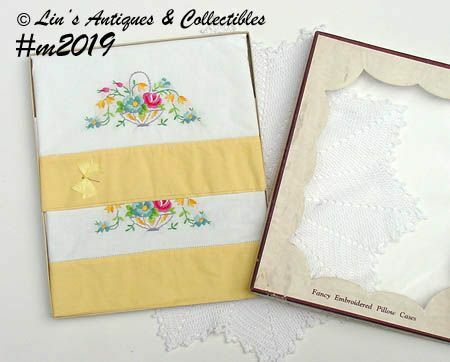 Lovely white pillowcases with embroidered basket of flower and still in their original box! They measure 19 ½” wide, 32 ¾” long, and per the box, they’re “A Droslin Product, Novelty Pillow Cases” and the original price sticker of $2.98 from Lerner’s Dept. Store is still on back of the box. Another pair of beautiful never used pillowcases still in their original box! 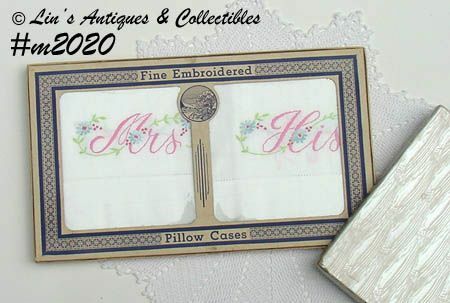 They measure 19 ½” wide, 29 ½” long, and per box, they’re “Fine Embroidered Pillow Cases”. I thought it very interesting that they are embroidered “His” and “Mrs.” instead of his and hers or Mr. and Mrs. I purchased these at a sale in Indiana. They have been laundered, lightly starched and ironed (by me) and then returned to the original box. 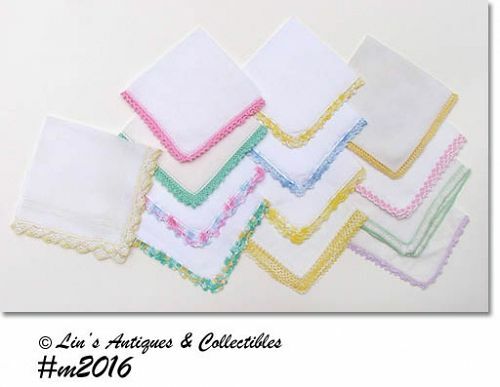 Twelve lovely crochet edge handkerchiefs in this listing! They have been laundered (no presoak or spot treat) and pressed and I am including 1 extra at no charge. Really neat Shawnee planter shaped like a lady’s high heel shoe! Planter is a pretty peach color with in-mold flowers. Marked USA and is in wonderful condition – no chips, no cracks, minor crazing (mostly interior). Has a production non-color/glaze at side bottom – not detrimental. 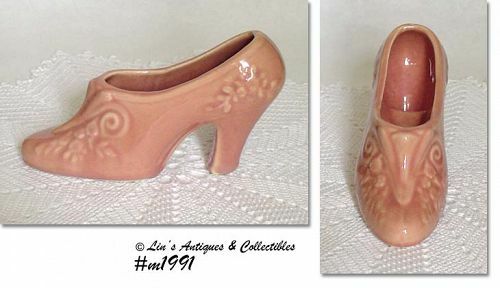 Cute item for the Shawnee or shoe collector!